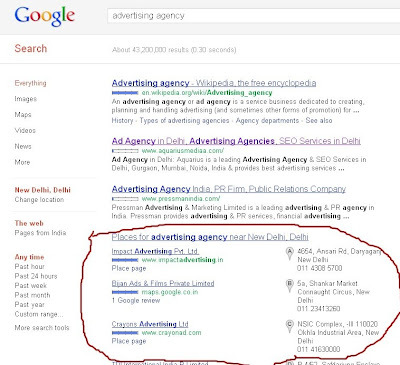 Google Places is the service of google which provide local business listing facility. Through Google Places we can advertise our website in particular city. Google places is the good alternate of paper directories. The one thing which I like in this service is that it is totally free we do not have to pay single amount for adding our listing in Google Places. If we properly optimize our Google place page then our website will soon appears on the first page of Google. Below you see the example of Google places. The listing which you have seen in the circle is Google Place listing. 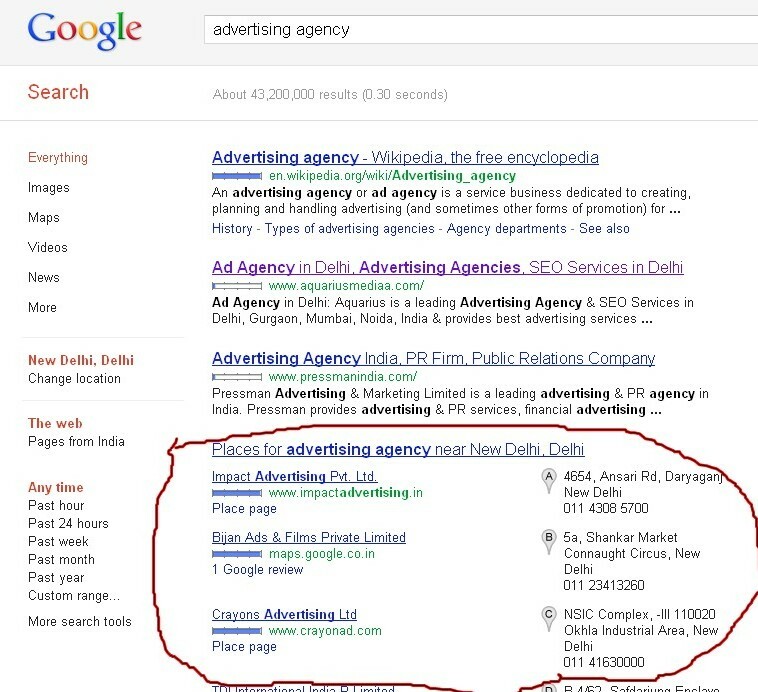 When someone search for advertising agency in new delhi then your website will shows in Google places local listing of new delhi advertising agency. If your listing is properly optimized then it will appear on the first page like below websites. 1. Google place is the good way of online advertising. Through this we can advertise website in our local city. 2. Google Place is totally free. 3. It is the good choice of marketing for the new website owners . Through this new website can gain quality traffic on his website without paying anything. 4. In Google Places listing we can display important information of our company like physical mailing address, your phone number, website name, working hours, company description, payment options etc. 6. It attached with the Google Map so its easy for the user to find our location. Informative post for me.Thanks a lot for sharing. I will use it for my website. Is there any disadvantage of Google place listing? No there is no disadvantage of Google Places. I am using this from last two years and I am quite happy with it. Thanks admin your site is great you are also learn SEO on This blog Learn Free SEO and Tips Thanks again. Nice sharing now days the scoop of SEO getting very intentions.